THANK YOU FOR THE LINK TOO!!! As soon as I know of more ways to promote our sites you will be the first to know! 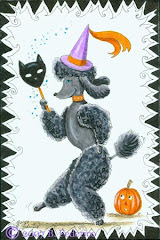 eBay Artist Becky Federico who creates whimsical art featuring Halloween Black Cats and Poodles. Cigar Box Purses, Cat Parody Oil Paintings, Postcard Paintings, Sculptures, Folk Art Boxes, and more. All of her art is Original and One of a Kind. 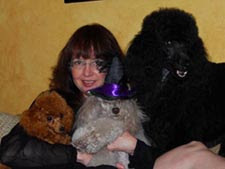 What Kind Of Name Is "Witchy Poodle Artist"? Greetings! 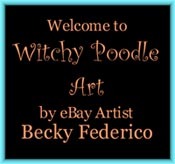 My name is Becky Federico, an eBay Artist who creates whimsical art featuring Halloween & Fantasy Black Cats and Poodles. All of my art is Original and One of a Kind. The links to my eBay auctions and Web Site are listed below. 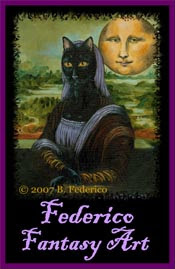 Purchase Art by Becky Federico ~ Direct from her studio! Becky was born and raised in the central valley of California and studied oil painting under Homer Spurlock of Southern California, learning in the old master's style. Becky gained popularity offering pet portraits and house portraits in oils. After moving from California to Western Washington state, she taught herself how to paint in acrylics, turning her art into a more whimsical style. I've Changed My Animal-Artwork eBay Name! eBay Links For One-of-a-kind Art! ahem! me-me-me-me! I've been tagged - me-me! 2 Hand Painted OOAK Cigar Box Purses! Under the present copyright law, art or a work is automatically copyrighted when it is created. ALL artwork, descriptions, titles, photos, text, logo, and derivative works from the past and present by Becky Federico, are not to be copied, imitated, or distributed in any way without the written consent of Becky Federico.